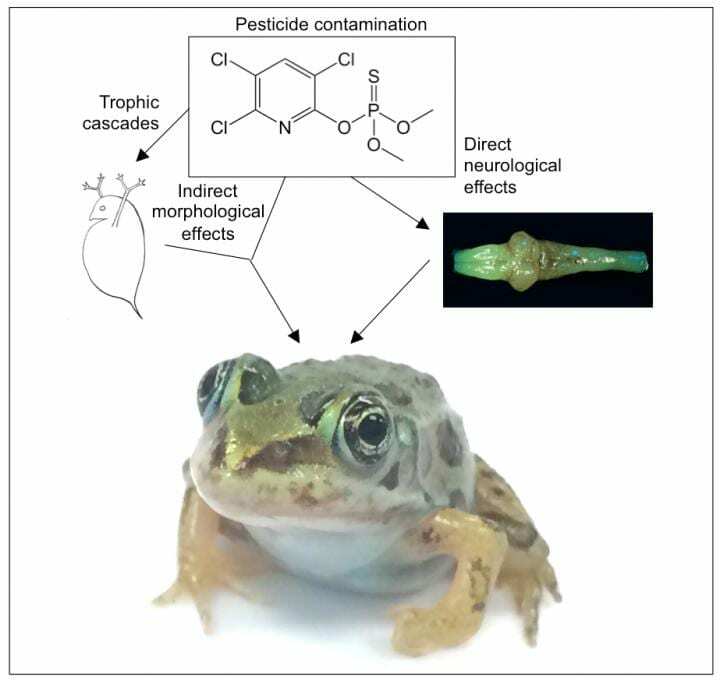 New research published in Environmental Toxicology & Chemistry reveals that low doses of a commonly used pesticide potentially harm the Northern Leopard frog by inhibiting their brain development. The pesticide chlorpyifos, which has been used since 1965 in both agricultural and non-agricultural areas, had clear effects on Northern Leopard tadpoles' neurodevelopment, even in situations where the pesticide did not cause a decline in the amphibians' food source. "Organophosphorous pesticides contaminate surface waters throughout the U.S. exposing both animals and humans to these chemicals, often at very low, presumably innocuous levels. However, this study demonstrates that exposure to these contaminants, even at these low concentrations, impacts vertebrate neurodevelopment," said lead author Sara McClelland, of Duquesne University, in Pittsburgh. The Society of Environmental Toxicology and Chemistry (SETAC) publishes two journals: Environmental Toxicology and Chemistry (ET&C) and Integrated Environmental Assessment and Management (IEAM). Environmental Toxicology and Chemistry is dedicated to furthering scientific knowledge and disseminating information on environmental toxicology and chemistry, including the application of these sciences to risk assessment. Integrated Environmental Assessment and Management focuses on the application of science in environmental decision-making, regulation, and management, including aspects of policy and law, and the development of scientifically sound approaches to environmental problem solving. Together, these journals provide a forum for professionals in academia, business, government, and other segments of society involved in the use, protection, and management of the environment for the enhancement of ecological health and human welfare.